Bogs, fens, swamps of cedar and other conifers, marly places; marshes, wet meadows and prairie-like ground, shores and interdunal pools or hollows; rock crevices and pools on Lake Superior. This is one of the most variable species in a genus noted for such variability. The inflorescence ranges from a broad pyramidal one with one-sided branches resembling that of S. juncea to the more common shape: a long cylindrical inflorescence. The latter goes well with the very narrow, elongate lower and basal leaves (up to 0.5 m long), of which the petioles are very distinctive, nearly or quite encircling the stem at their very base. 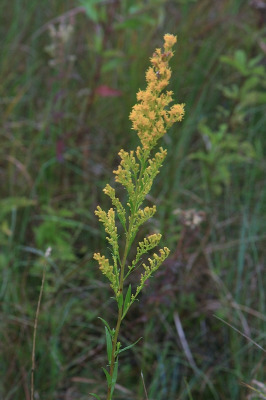 The stems and leaves are completely glabrous, except that the pedicels and branches of the inflorescence may be rough-pubescent or sparsely hirsute. Variability also results from hybridization (and presumed backcrossing), especially with neighboring species in wet habitats. Hybrids with S. patula (see also that species) can be recognized by somewhat angled stems and strongly scabrous upper surfaces of the leaves (as well as a tendency to have more toothed leaves). The leaves of S. uliginosa are nearly or quite entire, at most with rather obscure crenulate teeth. A few plants from Delta and Washtenaw Cos. with sharp teeth but smooth surfaces on the leaves suggest hybridization with S. gigantea. MICHIGAN FLORA ONLINE. A. A. Reznicek, E. G. Voss, & B. S. Walters. February 2011. University of Michigan. Web. 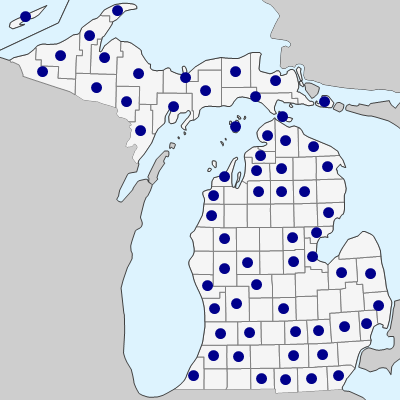 April 21, 2019. https://michiganflora.net/species.aspx?id=471.